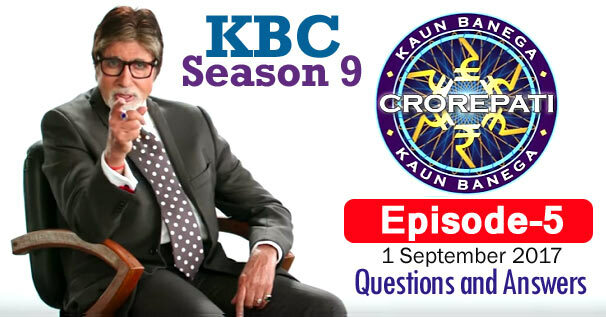 KBC Season 9 Episode 5 Questions and Answers: The fifth episode of Season 9 of Kaun Banega Crorepati (KBC) was telecast on 1st September 2017. In which Amitabh Bachchan had asked contestants 18 questions of General Knowledge. The correct answer to all the questions is given below each question. By reading these questions, you can prepare yourself for the next KBC Season 10 of Kaun Banega Crorepati. Because by reading these questions, you will understand what kind of questions asks Amitabh Bachchan in KBC. These all general knowledge questions will be helpful to for you various Competitive Examinations and Interviews besides KBC. Remember, the answer to some question may be in accordance with that time, while the answer to those question may differ according to the present time. 2. According to the Ramayana, Lord Brahma created Ahilya for which rishi as a reward for his 'tapasya' ? 5. Which Indian hill station gets its name from the Tibetan words that means 'Land of the thunderbolt' ? 7. What was the subject of the Henderson Brooks - Bhagat report ? 8. What is the name of Chandan Prabhakar's character in 'The Kapil Sharma Show' broadcast on Sony Entertainment Television ? 9. Inme se kis social networking site ka chinh ik 'Pakshi' hai ? 12. Which one of these Yogasanas is performed by lying flat on one's back ? 15. Who is the first Indian woman wrestler to win the 'Rajiv Gandhi Khel Rattan Award' ? 17. Who is the only bowler in ODI's both men's and women's cricket included, to take four wickets in a match without conceding a single run ? 18. Which Bharat Ratna dedicated his award to his mother and all the mother's who sacrificed their wishes for their children ?